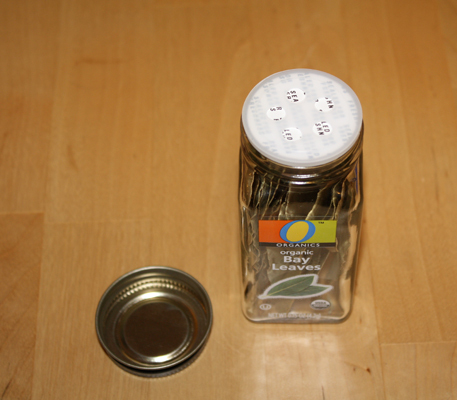 I bought some bay leaves at the supermarket the other day, and this is what I saw when I took the top off the jar. For some reason, all the soups and stews I’ve made recently have tasted like they’re missing an herb. 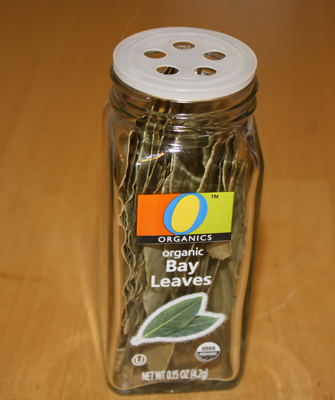 But on the bright side, I think this jar of bay leaves will last a long, long time. LOL! It’s been fool proved!! teeheehee! Perhaps it’s to limit your daily bay leaf intake to safe levels. I don’t know what kind of rumors you’ve been hearing, but I do not have a bay leaf problem. I can stop using them any time. Of course you can. Yep, I believe you. Really. You’ve just got to shake it really, really hard. Bay leaves are known to escape their jars and get into things they shouldnt, like chocolate pudding. It is best to leave the extra protection in place. Thank you. That’s the nicest thing anyone’s ever said about my bay leaves. Hilarious! For a second I didn’t know what was wrong with it. I’d be the one shaking it for an hour and wondering why nothing was coming out. No, but that’s a great idea for a product line! I’m going to start working on the automotive version — you know, the bay-leaf-scented air freshener in the shape of a bay leaf that you hang from your car’s rear-view mirror. It’s obvious… This is a single use package. Just add the whole bottle to your soup/stew/braising liquid, simmer for 90 minutes, then remove the bottle with bay leaves intact. This allows the dish to be infused with bay flavor without the safety hazard associated with choking on the actual leaves. I can’t believe I didn’t think of that. Did you know that Natalie was kind of paranoid about bay leaf choking hazards? She would have loved the idea of a bay leaf containment device. Hmm… Doesn’t surprise me. I remember Gail warning me about them, but maybe it was Natalie. In any case, I remember taking it very seriously. If only she had known about this trick. I never noticed that about sage, but I just checked, and the bottle of sage in my kitchen doesn’t have the holey-thing. Maybe they expect people to always buy sage and bay leaves at the same time. I am with Junk Drawer Cathy with my initial thoughts when I saw the pic. I thought, “hmm…does she have to poke holes in the paper for it to sprinkle?” Then of course, the picture that explains the dealio. Well, at least they’re organic. I was hoping that the shaker thingy would be enough of a distraction that no one would notice how pretentious my bay leaves are.